MS18-JUL (KB4022221) detected as missing - needs to be superseded? We’re seeing fixlet for KB4022221 start getting reported as missing and attempts to manually install he update result in exit code 17025 - “This patch is already installed”. Looking at the Microsoft Update catalogue for KB40222221, this has been superseded by MS18-NOV, KB4461473. Will the relevance be updated reflect this supersedance? It should be superseded. Looks like it got missed. I’ll inform the team. Should be superseded in Patches for Windows, version 3153. 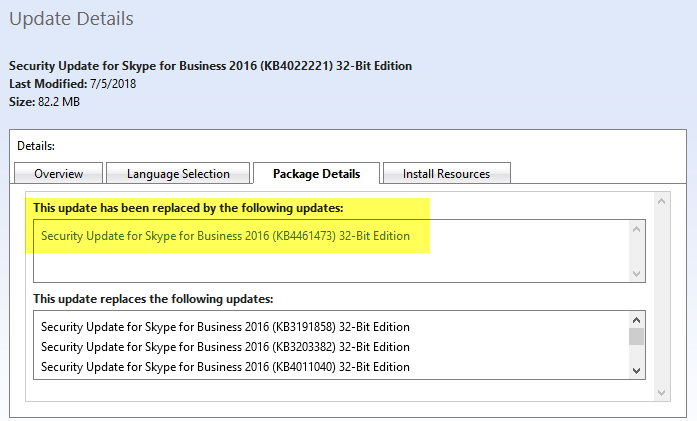 Sorry to Bump this up, but the replacement KB4461473 (32 Bit Version) which superseded the above , is exiting with a 17025 on multiple machines. Don’t think this is something the team can debug through the forums. Would recommend filing a PMR so the team can investigate further.